They're not year-round residents I take it? Feisty as they can be, they are a joy to have around. Kris: Sadly, they're only with us for about five months. I really do miss them when they're gone. They seem to get to know me during the summer because I spend so much time out in the garden and I refill the feeders. Sad to see them leave in the fall . . . Thrilled around May when we see them flitting about once again! Gorgeous shots Beth. It's a privilege to have them for at least part of the year, I would love to! Thanks! Yes, it truly is a privilege. They are enchanting--even when they're fighting! Oooooo yummmy. They are so amazing! Wow! Great shots! Ours are gearing up to go, but are still around. I enjoyed watching a lovely male ruby throat a couple of days ago, but he zoomed away before I could catch a shot of him. Thank you, Tina. We had a huge wave of migrators about a week ago after all the mega rains were done. I think they were stalled because of the big storms. I've never seen so many passing through at the same time before. Now I'm only seeing what I perceive to be a female and a couple of juvenile stragglers. They're very tame, so they seem to know me. Awww, they're so sweet. We're fortunate to have one species, the Anna's Hummingbird, that stays around to amuse us during the winter while the others migrate south. Your bird photos always amaze me. I can never capture birds or butterflies. Thank you, Linda. It helps that some of the hummingbirds are "regulars" all season, and they seem to know me. They fly up right next to me and "talk." They are so sweet--except when they fight. WOW! Great photos. Photo 9 makes me smile, it looks like he just wants to turn his head a little to see if you are really taking a photo of him. I will think of you, and thank my luck, when I see them hunting the garden for food this winter. Wow. These shots are just incredible! Thanks, Endah. They are amazing little birds! Yes, hummingbirds are amazing, Katharina! They're truly enchanting. If you ever have a chance to travel to a locale that has them--you will be rewarded with quite a show. I hope to get to Costa Rica (where they are plentiful) some day. Amazing photos, Beth! 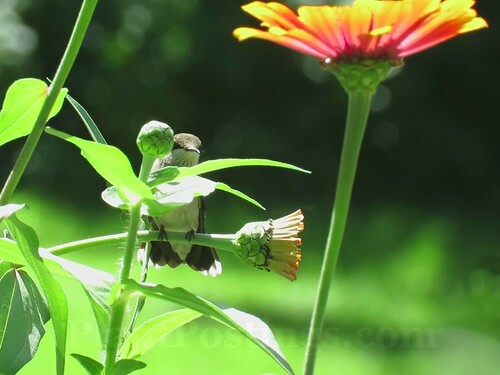 I didn't realize that hummingbirds were attracted to zinnias until this year. I've seen them flitting around them several times - boy do I wish I had a zoom lens!! Thank you, Margaret. 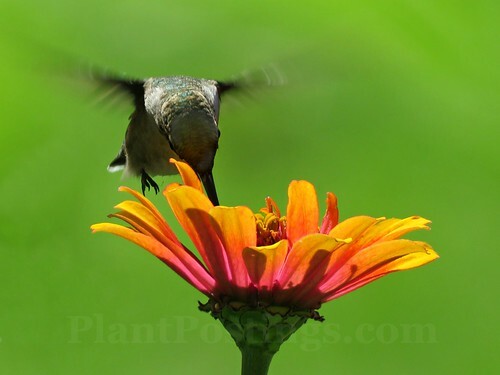 Yeah, isn't it great fun to see them circling around the tops of the Zinnias? 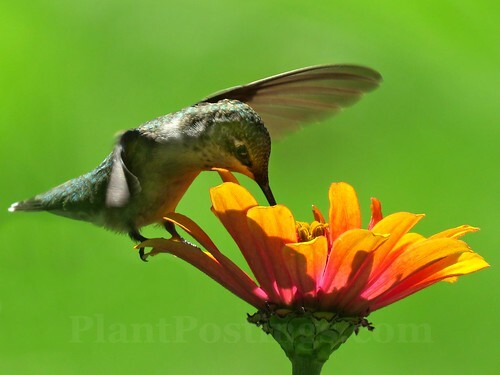 And they love the Cosmos and Mexican Sunflowers, too. So sweet! What remarkable photos, Beth! 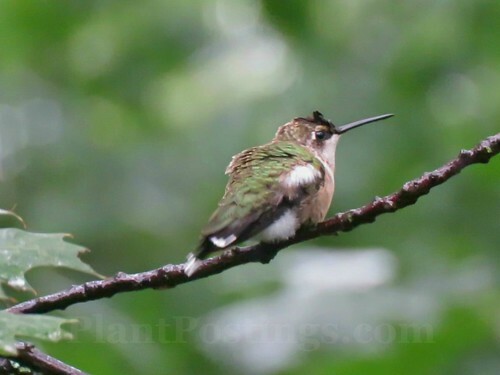 I hope we see a few hummingbirds in late September after getting back early next week, before they're gone. Thanks, Lisa. I'm still seeing them here, so I would think you'd still have some sticking around. I hope the hurricane isn't too hard on them. The heavy rains here seemed to have delayed the migration, and then tons of them all came through at once about a week ago. Crazy fights over the feeders! Wonderful photos Beth. 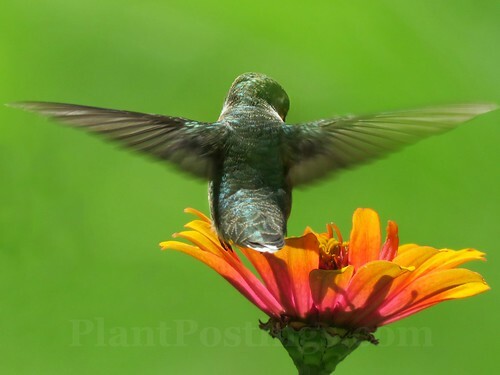 I haven't seen a hummingbird, nor even the hummingbird moth! Thank you. I wish they were here year-round, but we are fortunate to have them as residents for about five months. The hummingbird moth is awesome, too! Awww, such a sweet little birdie. They do keep the garden in a lively mode. Things can get quiet when they are gone. You will have to pull out these lovely photos when you get a little blue in February to remind you it won't be so long until they return. That's a good idea, Lisa. Although remembering them in February might be a little too painful. ;-) Yes, they do keep the garden a chirpy, happy place! My God, Beth, those photographs are just outrageously good! You must have deployed a lot of patience to get them. Thank you, Jason. They come right up to me and buzz my head when I'm near the feeders. 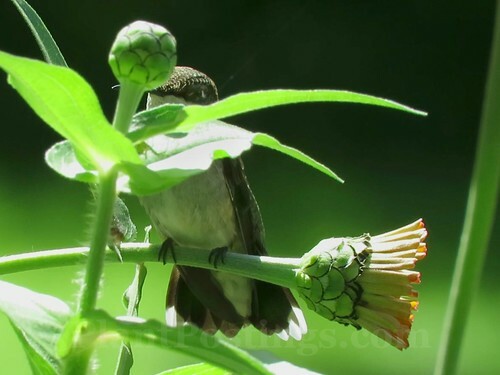 I discovered a trick this summer to sit at the corner of the front porch and photograph the goings-on in the pollinator garden--including the antics of the hummingbirds. They spend a lot of time there, so if I'm steady enough I can get some decent photos. Beth, those photos are fantastic! Did you use a telephoto lens? Thanks for the closeups! I can't get over these photos Beth! Your photographs are amazing, Beth. I haven't taken a decent hummingbird picture this summer. I'm going to check out that camera. Thank you, Pam. I tend to take the hummingbirds for granted after the initial springtime joy of seeing them again. And then just before they leave, I get sad thinking they'll be gone soon. It's so hard to say goodbye, but their return will be sweet indeed! Your photos are spectacular. The feather detail is wonderful! Oh, you're so kind, Aaron. 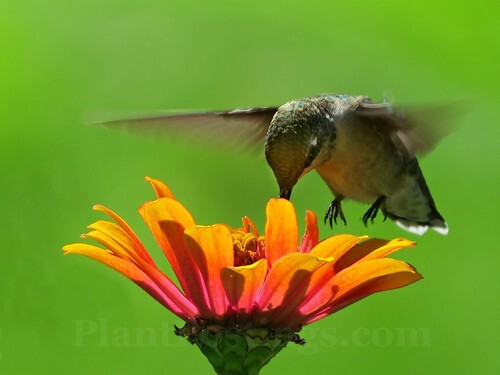 I do love hummingbirds and I'm so glad they like to live in the garden and travel through during the growing season. Stunning photographs Beth. What charming little birds. Well done on capturing the photos. Today one of our sunbirds was yelling at the cat - so I called her in - to let the bird enjoy the garden. Thanks, Diana. 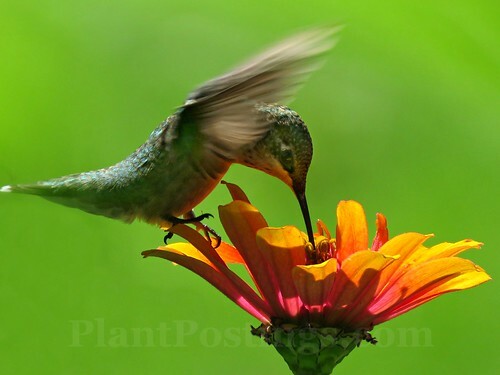 I was reading about sunbirds the other day--as relatives of hummingbirds, they must be fascinating to watch, too! My cat stays inside, but hummingbirds would be too fast for him to catch, anyway--they fly like lightening! What great photos! 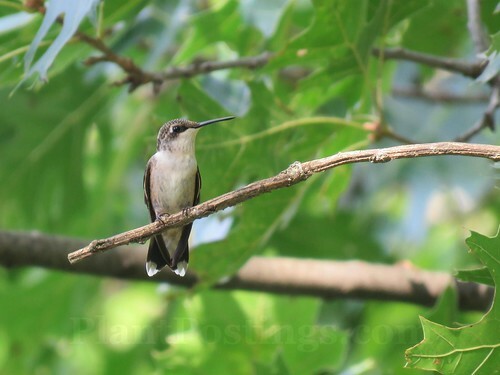 We usually have hummers here until well into October, and I too will miss them when they leave. Which reminds me: I need to make up some more juice for my hummingbird feeders; they are draining them fast! 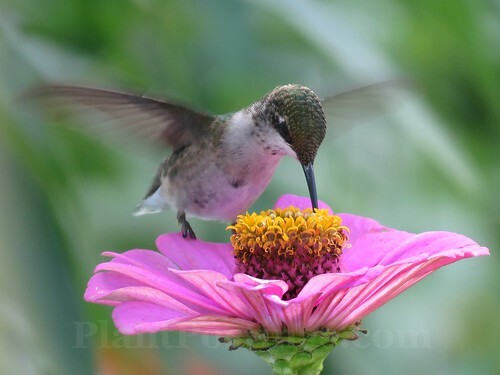 How wonderful to have such a close humming bird friend! It should give you a warm feeling knowing that the birds will leave, but they will come back because they want to. That is how true friends behave! These are phenomenal pics!!! I didn't even try to get a good one this summer. It was so hot & dry I didn't feel like sitting out there like usual. Thank you Beth for all your nice comments. You're the best at leaving those. I appreciate it. I'm still not sure about getting back into blogging but I am really liking Instagram suddenly. It seems easier??? Will have to look & see if you're out there. Happy Halloween to you too! !